Kelantan has two types of nasi kerabu; hitam (which is actually blue, coloured with butterfly pea flowers) and kuning (stained yellow with turmeric). 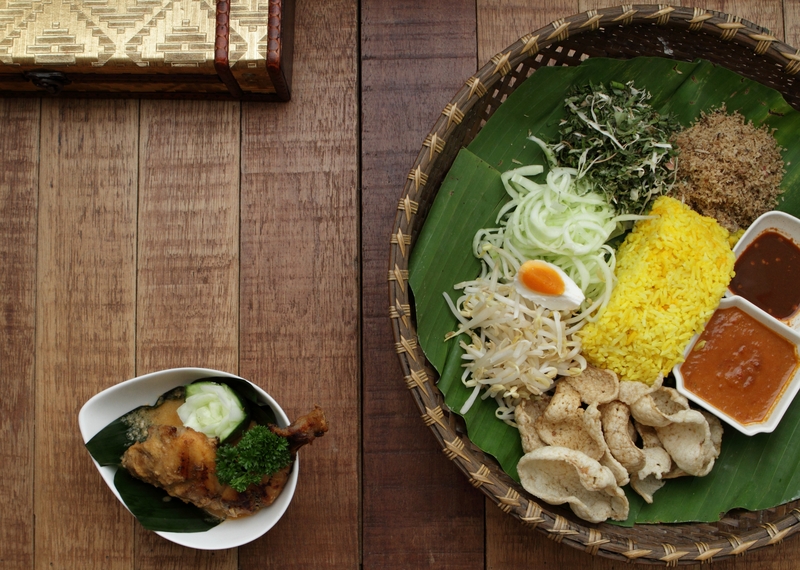 While the blue nasi kerabu is the most popular, Zainab says that the yellow is the most traditional, served in the Kelantanese palace. Place all the ingredients into a rice cooker, stir to mix, then cook. Place the ginger, chilies, onion and garlic into a blender and blitz to form a paste – add some water if you have to. Rub this mixture onto the chicken pieces and leave to marinate for at least 1 hour. Remove chicken pieces – keep the marinade – and place over a grill. Grill until golden brown, about 20 minutes on each side. Set aside. Place the leftover marinade in a pot over low heat. Add sugar, coconut milk and water, and cook until thickened, about 25 minutes. Season to taste, then place the chicken in the pot and cook for 5 minutes. Remove from heat and set aside. Place the ayam percik into a bowl and spoon sauce over. Slice all ingredients finely, then toss together. Place all ingredients, except coconut milk and oil, into a blender and blitz until smooth. Place oil in a pan over medium heat, then pour in the blended ingredients and coconut milk. Sauté until fragrant. Pack the rice into a rectangular container and unmould onto a plate or dulang (tray) lined with a banana leaf. Serve with sauces, ulam, accompaniments and ayam percik on the side.